Did you know that the umbrella was invented over 4,000 years ago? With so much time passed, it’s reasonable to expect significant innovation. The thing is, most of the umbrellas on the market today are the same as they have been for decades, perhaps even centuries. How can a product improve if it doesn’t change? Golfers are accustomed to companies to push the envelope, and we’ve set out to figure out if anyone has done that within the umbrella category. The process of buying anything in today’s time has become stressful and time-consuming. We feel the best reviews are those that help you make the right choices and help you get the most out of your time and money. This way you can buy with confidence and eliminate a lot of the guesswork. We are here to help show you how a product will perform before you buy. One key to our testing protocols is that we test products head-to-head. We select the top products from each category and put them through extensive and detailed head-to-head testing. We test both in the lab and in the field. We score each product across a range of weighted categories. We then rank the products, explain why, and give awards to the best-performing products in the category. An umbrella is expected to keep you dry, but it’s also a must for it to be durable as well as easy to use. Those looking for a golf umbrella, however, demand more. Everything from the grip of the handle, the speed of opening, the quality of materials, and the effectiveness of wind resistance were examined to determine the best golf umbrella of 2017. GUSTBUSTER TOUR SERIES GOLD $44.95 2 Manual Super Strength Fiberglass Customizable 62"
PING TOUR $65.00 2 Manual High Density Fiberglass 1 68"
SUN MOUNTAIN H2NO $44.96 2 Manual FiberGlass 1 60"
VICE GUARD $44.95 2 Automatic Carbon Fiber 1 55"
COBRA DOUBLE CANOPY $46.01 2 Automatic Faux Carbon 1 68"
PROCELLA 68 INCH $27.99 2 Manual FiberGlass 2 68"
BLUNT GOLF $71.10 1 Manual FiberGlass 5 57"
TOTES STORMBEATER $19.19 2 Automatic FiberGlass 4 60"
PROCELLA 62 INCH $27.97 2 Automatic FiberGlass 6 62"
TOTES AUTO OPEN GOLF NEVERWET SUNGUARD $30.00 1 Automatic FiberGlass 5 60"
LOUDMOUTH CLOVER $49.99 2 Manual Braided Fiberglass 1 62"
GFORE PEACE $120.00 2 Manual Braided Fiberglass 1 62"
SRIXON TOUR $59.99 2 Manual FiberGlass 1 62"
WILSON STAFF PRO TOUR $34.91 2 Manual Graphite 1 68"
We put in hours of testing leveraging data-driven protocols to examine new metrics. The process is more detailed than ever. To best examine golf umbrellas, we waited for rain and then headed outside to test. We tested in different over multiple days to see how the umbrellas would perform in a variety of storm conditions. During testing, the umbrellas were rated in multiple categories. In consultation with experts, we also created a series of lab tests. These tests focused on wind resistance, coverage, and handle effectiveness. 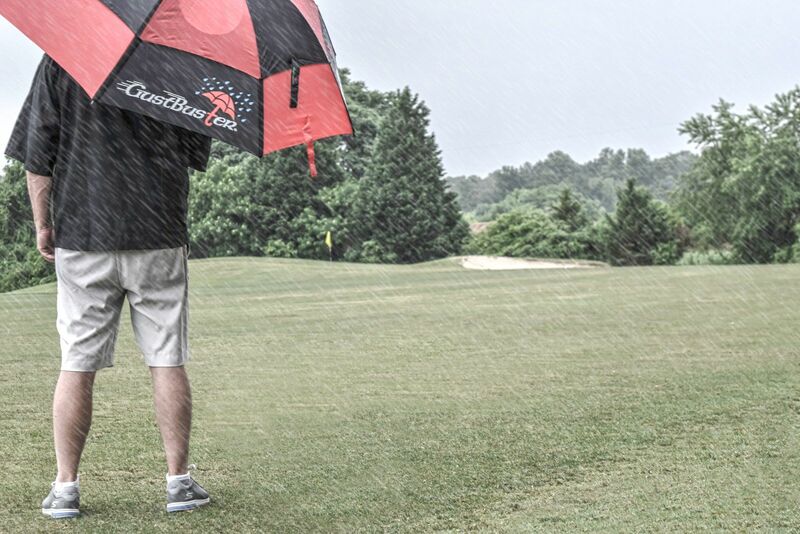 Wind Resistance (30 points) – We put the umbrellas to the test both in our lab and on the course. On the course, the umbrellas were subjected to storms with wind gusts of up to 45 mph. We then put the umbrellas to the test under simulated wind conditions. Poor performers had shafts that bent and canopies that nearly collapsed. Top performers didn’t falter at wind speeds approaching 50 mph. Coverage (20 points) – It’s important to note that an umbrellas diameter isn’t the sole factor in the coverage score. Some umbrellas are designed to provide greater clearance for the head, torso, and clubs. Umbrellas that feature domes that force the water to cascade out as opposed to down performed best. Poor performers were either too small, or their design didn’t maximize the potential coverage of the umbrella. Opening Speed (15 points) – How fast does the umbrella open? The opening speed score is a combination of both the velcro straps and opening mechanism. Some umbrellas have automatic opening while others must be opened manually. Umbrellas without multiple velcro straps were inconvenient to operate. 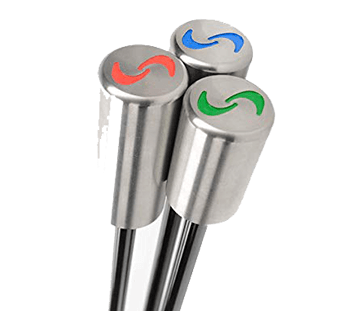 Handle (5 points) – How easy is the handle to hold in both wet and dry conditions? Do you feel like a gust of wind could blow the umbrella out of your hand? Umbrellas that performed had sandpaperlike-handles that were contoured to the hand. The best umbrellas are easy to grip under the wettest of conditions. Durability (30 points) – Is the umbrella made of high-quality materials? Is the umbrella constructed in a way that limits breakable pieces? Did the umbrella break during any portion of the test? An umbrella isn’t a bank-breaking purchase, but it’s important that it lasts for as long as possible. The best performers durability wise were incredibly sturdy, and some even boast lifetime warranties. Poor performers were battered around by the wind, while some even broke. Final grades were awarded based on total scores. 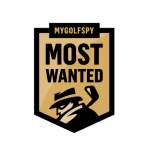 Best Overall is our highest overall scoring golf umbrella, and awards are given to the top three umbrellas. Also, more specific Best in Class recognitions are awarded to umbrellas in certain categories (like wind resistance, durability, and coverage) that push the industry’s design envelope. We also give an “Editor’s Choice” and a “Best Buy” award to those products that provide value products that compete with the bigger names on performance. 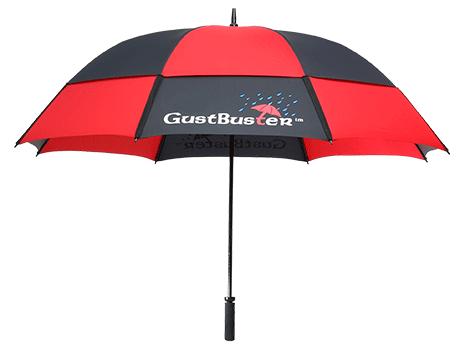 GustBuster has eliminated all fears of the elements with its wind resistant design. Even in the strongest winds, the elastic straps connected to the canopy allow the GustBuster to bend and flex without breaking. It’s the one standout design in the test. The super strength fiberglass shaft ensures the durability of the umbrella. A coarse handle promotes consistent grip even in heavy rain. The enormous 68 inch double canopy provides great coverage from wind and rain. Style plays exactly to the middle for consumers. The high-density Fiberglass shaft barely bends in strong winds. 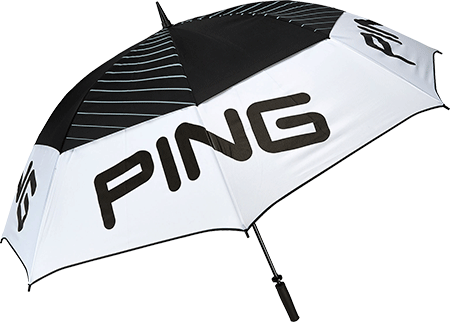 Another strong performer from PING’s accessory lineup. Did you know that Sun Moutain’s H2NO technology is featured in the company’s golf bags as well? The double canopy design holds up well in the wind and rain. Coupled with the sturdiness of the shaft, there is no fear of the umbrella snapping. 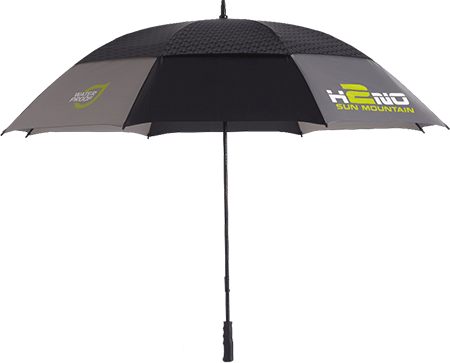 Integrated mesh between panels allows the umbrella to breathe for faster drying. Another metric to consider is sun protection / UPF rating? I use my Bag Boy sunbrella in sunshine and stormy weather. Agree, I use the Sun Mountain 50+ Sun protection, while walking in Texas. Over the years I have used a few different types and brands of umbrellas. The original gustbuster (15 + years ago) & various golf brands since then. Nothing comes close to Blunt umbrellas. These guys are an umbrella company, so they don’t just make umbrellas – they make great umbrellas. Their golf umbrellas are just part of their line up, and they look and function as you hope they should. Titleist even got them to design a special umbrella for them (that says a lot). I’ve got one, got my wife one (nice looking smaller style) and will be grabbing the kids ones for their golf bags. Check out their website – good read – great products. Have always favored the GustBuster umbrella and it weathered the winds of Ireland with no damage while I saw others in the trash cans. 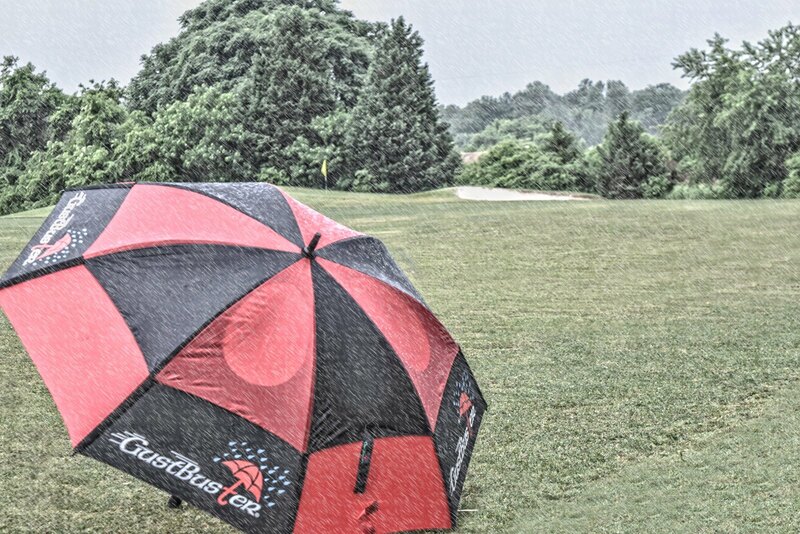 Also carry the Titleist double canopy golf umbrella because it is manufactured by GustBuster. I can get the best of both and a match for my golf bags. If you call them they will tell you which brands they make. Best umbrellas on the market. Did you test how the umbrellas did when used on an electric trolley? In stormy conditions they can often blow the trolley over. I know of one umbrella that can ‘turn into the wind’ but it doesn’t work when clamped in an umbrella holder. I have the Sun Mountain umbrella and when it’s attached to my cart it sometimes can produce this crazy thumping sound when the wind hits it. It’s like when you only have one window open while driving your car. One factor that isn’t covered is the height. In Denver, a lot of us use the umbrella stand on the cart to hold the umbrella when we’re walking to keep the sun from beating down to prevent sunburns, etc. Since I’m over 6 feet, I bought the RainStoppers 68-Inch Oversize Windproof Golf Umbrella, Black/White from Amazon for $20 to get the height I need. Hey at least they’re doing the small write ups again. For a time they stopped. Thanks guys for bringing the top three write ups back. One more umbrella attribute I’d like to see is weight. Maybe not a concern for cart people but is for carriers. Why can’t we get more info in these tests now than a few bullets about the top 3? For instance, what makes the Cobra and Porcella the fastest openings of the bunch? Yeah, I feel like the older reviews had much more in-depth write-ups. This is awesome. Thank you. Ping does pretty much everything well it seems. Things a little slow at MGS? Not at all. Busier than ever actually. We feel if there is a category it should be tested. And we feel very strongly about testing smaller categories and ones like this that are rarely tested at all. Not only do we feel it will help golfers not waste money we also think it might make the makers of these products in these categories begin to possibly improve those same products for consumers like yourself. No matter if it is a $400 driver or a $50 umbrella, we can all use information that helps us make more informed decisions. Love that you do EVERYTHING related to golf, not just clubs and balls. Keep up the great work! Is it true that Gustbuster umbrellas make Titleist umbrellas? Just a simple logo that is stickered onto a stock gustbuster? Yes, Gustbuster have their logo on the retail swing tag on Titleist umbrellas. Titleist don’t hide who manufactures their umbrella from the public. Gustbusters manufacturers umbrellas for Titleist as well as others. As stated in my earlier comment, if you contact them, they will let you know who they make umbrellas for. It is no secret. The only brand I carry in my bags (Titleist GustBuster). I want something I can always count on. They do not make them for FootJoy.